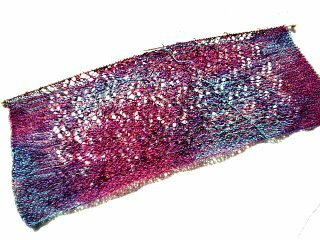 Re-born Knitter: Knitting and reading - the fun never stops! Above are photos of the Rosebud Shawl and the Vineyard Stripeys. You can see that my camera and I have issues. Not to mention that I keep forgetting how to save individual photos (after I've tweaked them to get them as clear and color-true as I can, which isn't very) in such a way that I can find them again and upload to the blog. Forgetfulness is a wonderful thing. Not. Also, I can't figure out how to upload more than two photos to any given post. Or, if I ever knew, I've forgotten that, too. 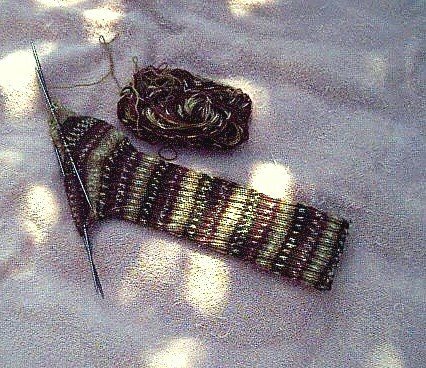 Last night while watching "Dune" on DVD, I snarled up the heel on Vineyard stripey, so today it's un-knit, un-knit. Rip-it, rip-it. Usually, sock knitting is a no-brainer for me, but I shouldna-hadna-oughtna tackled a heel while sucked into Dune. (The DVD reminded me how much I've enjoyed reading the book many times in the past. Maybe it's time to read it again.) I have several favorite books I re-read every few years - Dune is one of them. Also the Elswyth Thane Williamsburg novels (especially the first three or four) and Stephen King's "The Stand". And "Watership Down" by Richard Adams, "The Hobbit" and the trilogy by Tolkein, and all of Guy Gavriel Kay's novels. Sometimes I don't re-read entire books - just my favorite parts, but usually I start at the beginning and just read to the end. Hmmmm.